Sharon O’Halloran, CEO of SAFE Ireland, said that Ireland can be the safest country in the world for women and children. To achieve this, however, we have to change culture and attitudes that mean that domestic violence is too often not believed or taken seriously. 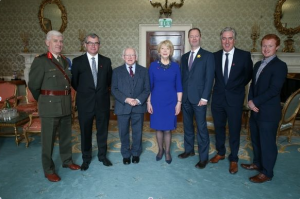 She was speaking at a special event hosted at Áras an Uachtaráin by President Michael D. Higgins as a Champion World Leader of the UN Women HeforShe campaign, World. HeforShe celebrates the positive and powerful role of men in promoting and supporting women’s rights and equality. The head of the national organisation of 39 domestic violence services said that on average 12,500 women and children look for support for domestic violence services in one year. However, research also shows that 79% of women who have experienced intimate violence never report the most serious incident to anybody. Only about 8-12% of women experiencing violence contact a domestic violence service. “We have to understand that the root of all violence is what happens in the home and home is not an island. It is clearly situated in society and clearly affected by culture,” O’Halloran said. “We must address our culture and attitudes because they affect the ability and confidence of most women to report violence and seek help,” she continued. “It is our culture and attitudes that determine how we hear and respond to domestic violence. It is our culture and attitudes that allow domestic violence to continue as a largely undocumented, underreported and unprosecuted crime in Ireland,” she continued. Special guests at the event included broadcaster Ryan Tubridy, an Ambassador for SAFE Ireland’s MAN UP Campaign, and global star Hozier, whose recently released single Cherry Wine is dedicated to raising consciousness about the complexity of abuse and was part of the campaign #FaceUpToDomesticViolence. Revenue from the single downloads are being donated to domestic violence services around the world, including SAFE Ireland. 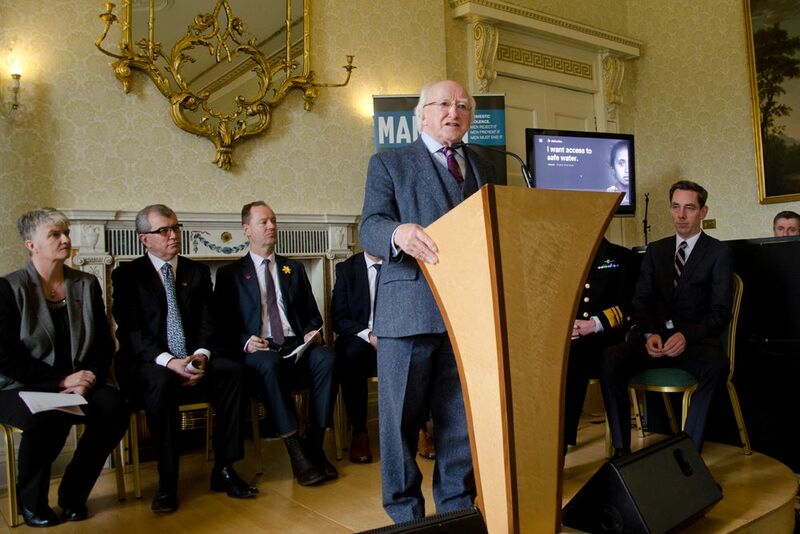 President Higgins was appointed in 2015 as a Champion World Leader of the UN Women HeforShe campaign, which seeks to encourage men – as individuals, role-models and leaders – to support gender equality. President Higgins and his wife Sabina have both been life-long campaigners for women’s rights and gender equality. Sabina has supported SAFE Ireland’s MAN UP Campaign, which promotes the positive and powerful role that men can play in ending domestic violence, in challenging abuse and in supporting women and children. President Higgins said “Throughout our public life, Sabina and I have been involved in many campaigns for equality – in the areas of labour, welfare, housing, education, healthcare and in relation to fertility and private life. Over those many years we have spent working on those issues, it has always been clear to us that women’s rights and equality is a political project in which men should have as great an interest and as onerous a duty as women. All of society loses when you have gender inequality. All of society is flawed if gender violence is allowed to occur, is tolerated, and if an intolerable silence prevails around this grave issue. Then too, no invocation of cultural differences or tradition can ever be accepted as an excuse for gender violence. The Defence Forces were in attendance alongside IBEC, the FAI, ICTU, the Union of Students of Ireland who all pledged their involvement with the MAN UP campaign.